PART ONE / Numbers from Nowhere? "Marvelous. . . . A sweeping portrait of human life in the Americas before the arrival of Columbus. . . . A remarkably engaging writer." "Fascinating. . . . A landmark of a book that drops ingrained images of colonial American into the dustbin, one after the other." "A ripping, man-on-the-ground tour of a world most of us barely intuit. . . . An exhilarating shift in perspective. . . . 1491 erases our myth of a wilderness Eden. It replaces that fallacy with evidence of a different genesis, exciting and closer to true." 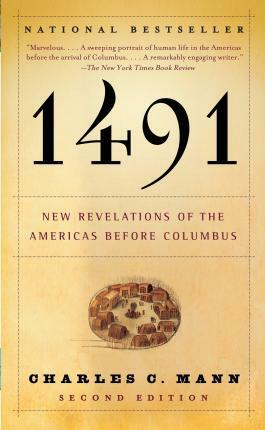 "Mann tells a powerful, provocative and important story. . . . 1491 vividly compels us to re-examine how we teach the ancient history of the Americas and how we live with the environmental consequences of colonization." "Engagingly written and utterly absorbing. . . . Part detective story, part epic and part tragedy." "Provocative. . . . A Jared Diamond-like volley that challenges prevailing thinking about global development. Mann has chronicled an important shift in our vision of world development, one out young children could end up studying in their text books when they reach junior high." "Marvelous. . . . A revelation. . . . Our concept of pure wilderness untouched by grubby human hands must now be jettisoned." "Monumental. . . . Mann slips in so many fresh, new interpretations of American history that it all adds up to a deeply subversive work." "Concise and brilliantly entertaining. . . . Reminiscent of John McPhee's eloquence with scientific detail." --The New York Review of Books "Marvelous. . . . A sweeping portrait of human life in the Americas before the arrival of Columbus. . . . A remarkably engaging writer." --The New York Times Book Review "Fascinating. . . . A landmark of a book that drops ingrained images of colonial American into the dustbin, one after the other." --The Boston Globe "A ripping, man-on-the-ground tour of a world most of us barely intuit. . . . An exhilarating shift in perspective. . . . 1491 erases our myth of a wilderness Eden. It replaces that fallacy with evidence of a different genesis, exciting and closer to true." --The Cleveland Plain Dealer "Mann tells a powerful, provocative and important story. . . . 1491 vividly compels us to re-examine how we teach the ancient history of the Americas and how we live with the environmental consequences of colonization." --The Washington Post Book World "Engagingly written and utterly absorbing. . . . Part detective story, part epic and part tragedy."